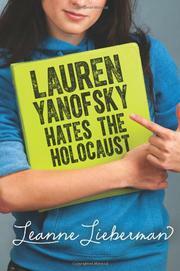 A Jewish teen who has decided to become “un-Jewish” experiences a soul-searching junior year. Lauren found herself with a newly formed nonreligious identity after questioning her Jewish education, her father’s profession as a Holocaust historian and her discomfort with Judaism’s commemoration of centuries-old persecution. After eight years of Jewish day school, Lauren convinced her parents to let her attend public high school, where she has strengthened friendships with some of the gentile kids from her neighborhood. But these kids are changing too, and some of their new interests (Bible study group and the smokers’ crowd) leave Lauren lost in a teen world in which she is unwilling to participate. When she comes across a group of her male peers playing war games as Nazis, Lauren’s discomfort with her own reaction creates powerful psychological turmoil, which is complicated when she dates one of the boys. Lauren’s Judaic background includes her grandmother’s Holocaust past, in which 11 family members perished. Lieberman, known for her edgy, provocative Jewish-themed novels, Book of Trees (2010) and Gravity (2008), creates another strong female protagonist, whose characterization of Judaism as a religion “about loss, grief and persecution” will raise eyebrows with both Jewish and non-Jewish readers.